This half day tour can be perform in the morning or afternoon. The journey will normally take less than an hour drive. 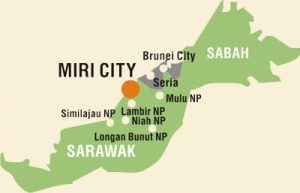 The Lambir Hills National Park is located along the Miri-Bintulu Road,about 23km from Miri. This park covers an area of 6,952 hectares and was gazette as a national park on the 26th june 1975. Besides the extraordinary species-rich forest,Lambir National Park,due to its rugged terrain,boasts of a number of small but beautiful waterfalls which attract many visitors especially during weekends and holidays. Upon arriving,register at the Park HQ the proceed onto scenic Latak Trail which boasts of 3 waterfalls.the third waterfalls is about 25 meters high and plunges into a large deep pool with sandy poolside. There are 4 summer huts located around the pool and public toilet and shower facilities too. After swimming we return back to Miri. Return transfer from hotels, guiding service, entrance fee, packed lunch, boat fee. Please ready torch light, raincoat, running shoes (the planks maybe slippery esp after rain).